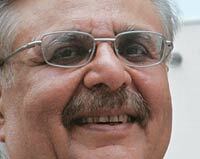 Yogesh Chander Deveshwar has been with ITC for nearly 43 years, the past 15 as chairman and chief executive. Having turned ITC into a multiproduct company no longer synonymous with cigarettes, he is seeking a five-year extension during which a successor will be anointed. In a candid interview with Chaitanya Kalbag, he talks of ITC's future-ready status, government policies that are affecting its most ambitious initiative for rural India, and more. Edited excerpts. See, firstly when the shareholding gets dispersed and there is no single dominant shareholder then the consequence is that the ownership gets divorced from management. So in our case the professional character… is facilitated by the dispersal in shareholding so that it has become a totally board-managed company. Of course, that was not the case in the past. Obviously, the professional management that runs this enterprise and is accountable to the board has to continue to perform and performance is the only basis through which you could continue to wield the power over the resources that are made available to you to create value. On how ITC retains talent despite being in a competitive business. The thing is, in ITC, we stand apart as a professionally managed company. Anybody who joins today as a pupil or an assistant under training can aspire to be in my place. It is a meritocracy… And, of course, we are not the best paymasters. I am not the highest paid chief executive in the country nor are my managers the highest paid. But if you look at the compensation in totality, in terms of opportunity, in terms of job enrichment, in terms of expression, in terms of freedom to create and self expression, you would find that people are happier being here than making a faster buck somewhere (else). There is a lot of pride, and pride comes from the kind of value we are creating... We have created livelihoods for tribals… We are a water-positive company, we are a carbon-positive company, we are a waste-recycling-positive company. Almost five million jobs get created out of ITC's businesses. So, when people look at all this, it is a very elevating experience. There is a nomination committee that meets periodically… In ITC reside a number of companies. These businesses are run by chief executives and there is a succession plan… And we have created newer businesses, we found chief executives from within to run those businesses. So in a manner of speaking, within one legal entity, we are running almost 13 companies. We are not necessarily hung up on a particular retirement age, because there are many people who are not on the board, but go on to serve till the age of say 68. For example, our chefs, even at the age of 70, some of them are working, but it is not reported. Nokia buys their entire packaging from us... Tatas buy their entire copier paper from us. This is the greenest paper in India. Now, ITC prefixed hotels at the luxury end are all LEED Platinum-rated hotels. This is the only chain in the world where all the hotels in the chain are LEED Platinum rated. Do you know that tobacco consumption in India is growing, but the share of cigarettes in the tobacco basket has declined? Media and everybody, when they talk about tobacco, they show cigarettes and talk about cigarettes and they have never talked about the other forms of tobacco. As a result, all the restrictions, taxation, everything came on cigarettes. So silently, other forms of tobacco consumption like chewing tobacco have grown by leaps and bounds. Recently, the government did a survey… and they found that 80 per cent of the cases of cancer are relatable to chewing tobacco. Therefore, 20 per cent is from smoking. Within smoking, beedis outnumber cigarettes by nine (to one). And their delivery of tar and nicotine is much higher, you know... And we are the lowest per capita consumers of cigarettes in the world. Only 99 cigarettes per capita versus 2,500 cigarettes in Japan and almost 2,000 cigarettes in the US… assuming we gave up doing cigarettes, they will all be smuggled... So, it is not an objective of ours to abandon this, or it should not be an objective of the government to ban it, because if it does, it will lose revenue and also encourage smuggling. The relationship has been very cordial. Barring that period in 1995-96, when there was disquiet... this company almost sank in that period... (Then) they wanted to take over the company! That was the cause of the battle. After that I must give them credit they have begun to respect ITC as a professional, board-managed company. "I am not the highest paid chief executive in the country nor are my managers… But people are happier being here than making a faster buck somewhere else"
Our market capitalisation is about $31 billion and their market capitalisation would be around $70 or 75 billion. We are a fairly sizable enterprise. In those days we were tiny. For example, in the year that I took over, the bottom line was Rs 250 crore. Today it is Rs 5,000 crore. The top line was Rs 5,000 crore. Today it is Rs 26,000 crore. That is why some of our growth tends to be slower and that is why we have chosen branded fast moving consumer goods as an avenue of growth because I don't have to get a mining licence, don't have to get spectrum, I don't have to get those kinds of things. If the consumer likes my product… I can even outsource my production, the formula can be mine. Someone else can produce under my supervision. So to that degree it is a safer thing for a professional enterprise like ITC. But I agree with you, you know, even then we have not yet abolished completely the licence-permit raj. Even in the area of e-choupal, the way we operate, we have been enabled through the amendment of the APMC [Agriculture Produce Market Committees] Act that was done by the Centre and recommended to the states to amend their acts similarly. But some of the states have not gone the whole hog, but gone halfway and converted into a permit licence raj. They give you three-month permits to do things! That is why, you know, innovation of that magnitude that could have transformed India's rural landscape has got stymied, because we are not able to operate with that much freedom... Periodically, they re-impose the Essential Commodities Act. If you are going to operate with the farmers and you promised that you will buy at the farm gate, if there is an Essential Commodities Act, then you cannot store. Therefore we cannot buy! So it gets into the hands of the middlemen who are able to manage the laws… After all wheat is grown and marketed for only four months in a year, but it is consumed for 12 months a year. So if ITC can't procure from the farmer, then somebody else will procure and store… And make a cool buck on it! People who have power in this country appreciate what I am saying. But these are the limitations of coalition governments. So I am told. I can understand that too. Because at the end of the day, you can see that, you know there is autonomy of coalition partners to the extent that if you want to control anybody… then you have to put the life of your government at stake. And the option (alternative) is not getting any better!